An agate model of a crouching hare, naturalistically depicted facing forward in an alert position. The hare has its long ears folded back, bulging eyes and flared nostrils. The animal has a short tail and the details of the paws and hair are carefully incised. The mainly orange-red coloured stone is translucent in some parts, with some smoky brown and black lines. The surface of the stone is smooth and well polished. Agate pieces grew in number among the jades from the Eastern Zhou period (770 – 256 BC) onwards, often incorporated into pendant sets to add more glamour to them. Agate ornaments were highly valued for their exceptional durability and glossy appearance, as well as their supreme workmanship. A hare or rabbit has long been a very popular animal in Chinese art; it has a special importance as a Daoist symbol associated with immortality and hence longevity. According to Daoist legend, a ‘moon hare (yuetu)’ lives on the moon together with the Goddess of the Moon, Change, with a mortar and jade pestle. Beads or toggles in the form of a crouching hare, often with a perforation drilled through, were used from the Han dynasty (206 BC – 220 AD) onwards, such as a jade example in the collection of the Museum of East Asian Art, Bath. Carvings of hare were often found as weights or as tomb models during the Tang dynasty. The lifelike depiction of this alert hare is charmingly rendered and lends the animal instant appeal. A closely comparable yellow brown jade hare, smaller in size and dated to the Tang dynasty, is in the collection of the British Museum. 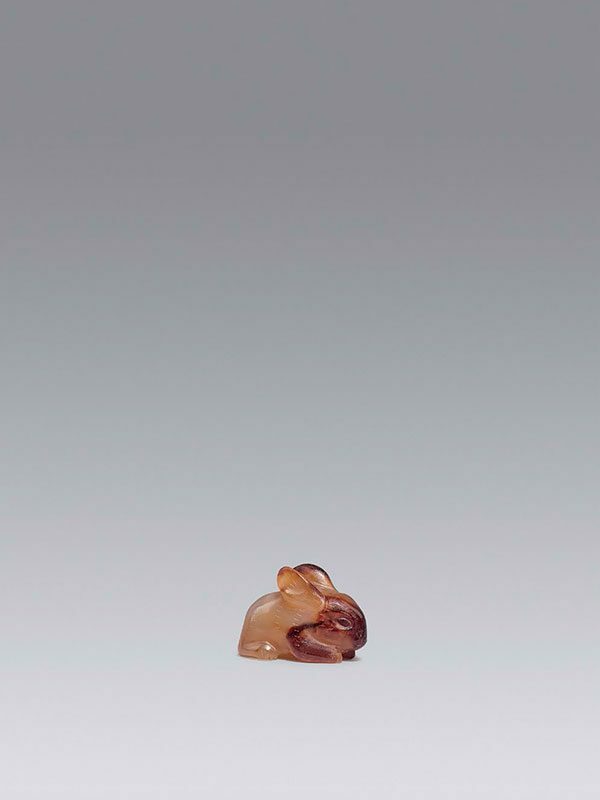 A later white jade hare similar in size and dated to the Song dynasty or later is in the collection of the Museum of East Asian Art, Bath.